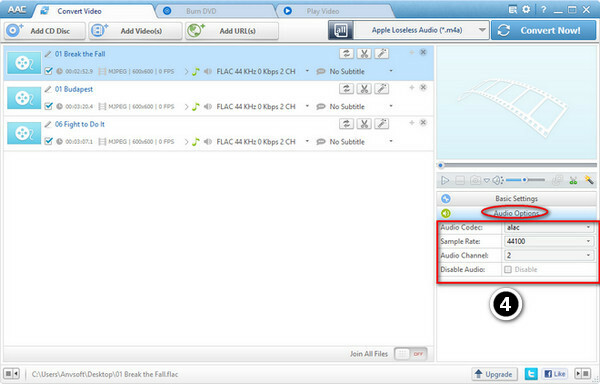 FLAC stands for Free Lossless Audio Codec, which means audio is compressed in FLAC without any loss in quality. 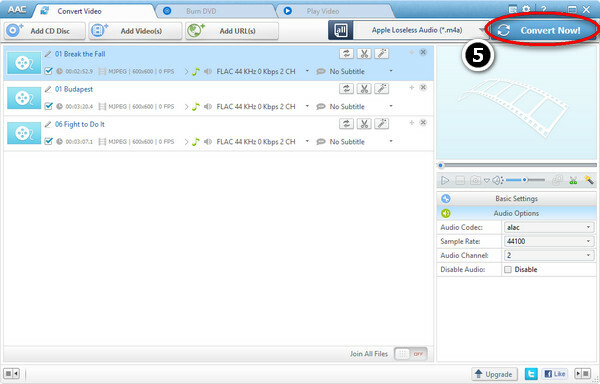 Though FLAC is free, open-source format and can be played on many players such as car or home stereo, it is yet to be supported by Apple Mac computer and Apple portable devices. To enjoy incredible quality FLAC audio on Mac and any Apple devices, we need to convert FLAC to Apple Lossless. Apple Lossless, also known as ALAC (Apple Lossless Audio Codec), or ALE (Apple Lossless Encoder) is an audio codec developed by Apple Inc. for lossless data compression of digital music. According to Apple, audio files compressed with ALAC will use up "about half the storage space" that the uncompressed data would require. ALAC can be played on all current iPods, iPhones and iPads, and will play on QuickTime 6.5.1 and iTunes 4.5 and on their later version. 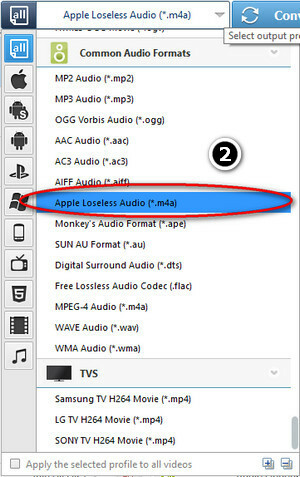 Here is a free but best FLAC to Apple Lossless Converter, with a detailed step-by-step guide on how to directly convert FLAC to Apple lossless ALAC. The FLAC to Apple Lossless Converter is completely free of charge. 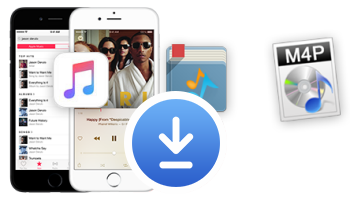 Click the Download button below to have a try Free FLAC to Apple Lossless Converter. WAV -- WAV is an audio file format that was developed by Microsoft. It is so wide spread today that it is called a standard PC audio file format. A Wave file is identified by a file name extension of WAV (.wav). Used primarily in PCs, the Wave file format has been accepted as a viable interchange medium for other computer platforms, such as Macintosh. This allows content developers to freely move audio files between platforms for processing, for example. AIFF -- AIFF (Audio Interchange File Format) is a file format used by Macintosh computers and Silicon Graphics Incorporated to store and transmit high-quality audio data, such as music. These audio format is uncompressed, very similar with WAV format. FLAC -- The Free Lossless Audio Codec (FLAC) is the most popular lossless format, making it a good choice if you want to store your music in lossless. Unlike WAV and AIFF, it's been compressed, so it takes up a lot less space. However, it's still a lossless format, which means the audio quality is still the same as the original source, so it's much better for listening than WAV and AIFF. It's also free and open source, which is handy if you're into that sort of thing. Apple Lossless -- Also known as ALAC, Apple Lossless is similar to FLAC. It's a compressed lossless file, although it's made by Apple. Its compression isn't quite as efficient as FLAC, so your files may be a bit bigger, but it's fully supported by iTunes and iOS (while FLAC is not). Thus, you'd want to use this if you use iTunes and iOS as your primary music listening software. APE -- APE is a very highly compressed lossless file, meaning you'll get the most space savings. Its audio quality is the same as FLAC, ALAC, and other lossless files, but it isn't compatible with nearly as many players. They also work your processor harder to decode, since they're so highly compressed. Generally, I wouldn't recommend using this unless you're very starved for space and have a player that supports it. MP3 -- MPEG Audio Layer III, or MP3 for short, is the most common lossy format around. So much so that it's become synonymous with downloaded music. MP3 isn't the most efficient format of them all, but its definitely the most well-supported, making it our first choice for lossy audio. AAC -- Advanced Audio Coding, also known as AAC, is similar to MP3, although it's a bit more efficient. That means that you can have files that take up less space, but with the same sound quality as MP3. And, with Apple's iTunes making AAC so popular, it's almost as widely compatible with MP3. I've only ever had one device that couldn't play AACs properly, and that was a few years ago, so it's pretty hard to go wrong with AAC either. Ogg Vorbis -- The Vorbis format, often known as Ogg Vorbis due to its use of the Ogg container, is a free and open source alternative to MP3 and AAC. Its main draw is that it isn't restricted by patents, but that doesn't affect you as a user—in fact, despite its open nature and similar quality, it's much less popular than MP3 and AAC, meaning fewer players are going to support it. As such, we don't really recommend it unless you feel very strongly about open source. WMA -- Windows Media Audio is Microsoft's own proprietary format, similar to MP3 or AAC. It doesn't really offer any advantages over the other formats, and it's also not as well supported. There's very little reason to rip your CDs into this format. 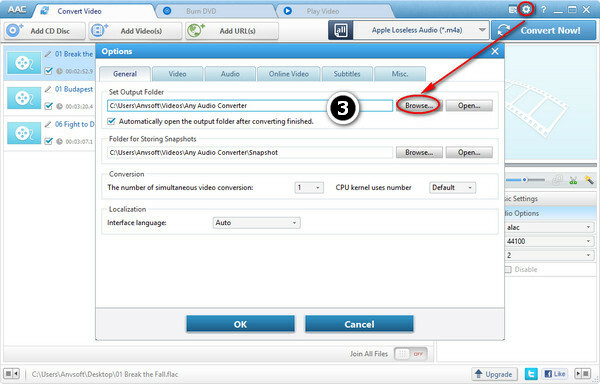 FLAC to Apple Lossless Converter is powerful audio file converter for FLAC conversion. It can convert FLAC to Apple Lossless ALAC and Apple loss M4A, convert FLAC to other lossless audio like AIFF and WAV, convert FLAC to any other audio formats, as well as convert between all popular audio formats. In addition, with FLAC to Apple Lossless Converter, you can merge, trim, split FLAC audio files, adjust audio quality to customize output audio and more. 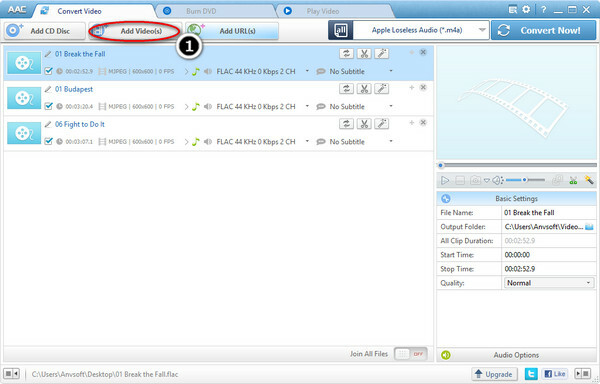 Click "Add Video" button on the main window to select the flac files you want to convert. Click "Output Format" and choose Apple Loseless Audio(*.m4a) from drop-down list. To set the folder that you want to save your target file. Adjust some special settings for your conversion by clicking "Audio Option". Step 5. Start the FLAC to Apple Lossless Conversion. You can start to convert FLAC to Apple Lossless by clicking "Convert Now" button. Why not download and have a try this totally free FLAC to Apple Lossless Converter, which is specific designed for you to convert Flac file to lossless formats. 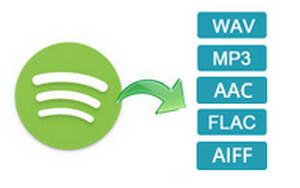 Including Flac to M4A, Flac to Apple Lossless, Flac to APE, Flac to WAV and more. And you may want to import the lossless audio file to your iPad, iPhone or iPod. The free Syncios iOS Transfer would be the best choice for your to transfer videos and music from computer to your iOS device without the complex iTunes. MP3 (MP3), WAV (WAV), WMA (WMA), Flac (FLAC), AC3 (AC3), AAC (AAC), M4A (M4A, M4R), OGG (OGG), AMR (AMR) Other Audio Formats: AU, AIF, AIFF, AIFC, ADTS, ALAW, AMR, APC, APE, CAF, DTS, GSD, GSM, MKA, MLP, MMF, MP1, MP2, MPEG3, MPC, MP+, M2A, NUT, OMA, QCP, RA, RR and more. Record songs at 10X Faster speed with 100% lossless quality. No need to install Spotify client. Convert iTunes M4A, M4B & Audible AA, AAX audiobooks to plain format. Keep Lossless Output Quality & ID Tags Information. How to Convert CDA to MP3 Format? How to Convert AA to MP3?